Flight time 8 hours from London. 17 hours from NYC. Here at Black Tomato we’re all about unearthing new destinations and opening your eyes to different cultures across the globe. Recently, our Travel Experts have been exploring the vast continent of Africa, a place that never fails to surprise us, and one destination we can’t wait to tell you all about is Ethiopia. 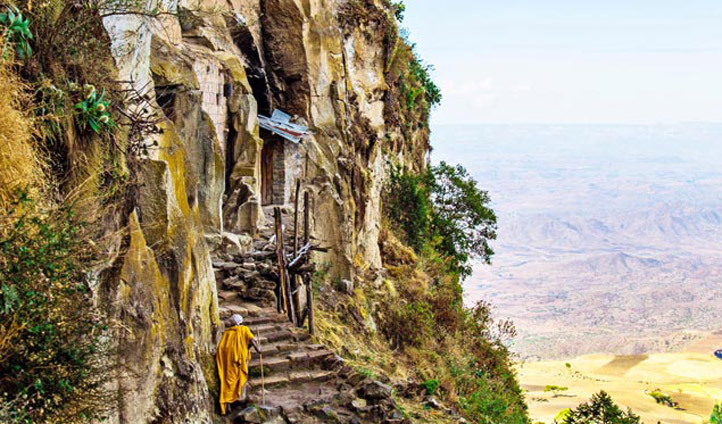 A country that is greatly misunderstood, Ethiopia is one of Africa’s most unknown and enriching destination’s with it’s UNESCO World Heritage Sites, age-old traditions and incredible landscapes that are the perfect setting for an extreme adventure. We love the fact that Ethiopia is still undiscovered by the masses, yet visiting this impressive land takes a bit of planning and know how, and that’s where we come in. Our Travel Experts have crafted this unique 10 night cultural exploration, which will show you the best of Ethiopia from it’s most unmissable sights to a few hidden gems with our expert guides. You’ll be floating over the UNESCO World Heritage Site of Lalibela by hot-air balloon, haggling your way through bustling markets in Addis Ababa and trekking through the wild Simien Mountains and untouched Bale National Park in the south. Along the way you’ll stay in some of our favourite eco-lodges nestled deep in the mountains of this great African nation. For those of you really looking to push the boundaries we can take you deep into the Omo Valley where you’ll be immersed in tribal cultures, or test your limits in the Danakil Depression, one of the hottest places in the world and where you can summit active volcanoes and join camel caravans across the eerie landscapes. Home to 80 nationalities, Ethiopia’s capital, Addis Ababa is a culturally diverse city and the perfect starting point for your Ethiopian education. As you acclimatize to the 2400 m altitude you’ll be guided by an expert through winding streets before visiting the Ethnographic Museum where you’ll discover the history of this ethnically rich country. For music lovers Addis is where we can arrange for you to discover the delights of Ethio-Jazz, a unique fusion of traditional music, Afro-funk and jazz that’s played out in some of the city’s best night spots. 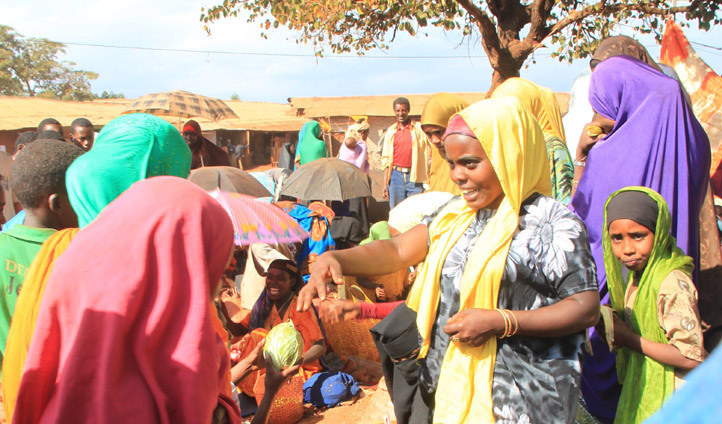 On your second day in this fascinating country, a two hour flight will transport you from Addis Ababa to the historic utopia of Lalibela, a UNESCO World Heritage Site. It’ll feel as if you’ve stepped back in time as you walk through the ancient village with its red round houses, natural beauty and religiously poignant reputation that attracts Coptic Christians from all over the world. Hewn from the rock itself these iconic subterranean churches are a feat of engineering and architectural splendor. Over the next two days delve inside the history of a world gone by as you marvel at the huge monolithic structures that are as remarkable as the day they were built in the 12th century. While in the village you can unleash your inner foodie as you learn how to make traditional dishes including Wat, a deliciously spicy hot stew or if you’re a caffeine addict enjoy a local coffee ceremony. Here you’ll be staying at the Mount View Hotel and as the name suggests you’ll be treated to spectacular views of the rugged mountains and Ethiopian countryside. For a final thrilling experience we’ll send you sky-high over the Lalibela in a hot air balloon, offering you the chance to appreciate this magnificent site from another perspective. A private charter flight will then transport you to Gondar, followed by a private car journey through the magnificent scenery as you make your way to Simien Mountain National Park, the next stop on your Ethiopian adventure. With 180 different species of bird and 35 mammals including the native Ethiopian wolf and the Gelada Baboon, you’re sure to see something new each day. You’ll be roaming this vast UNESCO World Heritage site on foot or by jeep on an authentic safari experience before spending the next two nights relaxing in Africa’s highest hotel, the Simien Lodge, your very own secluded retreat nestled in the rural mountainside. Climb even higher to Chenek, a small campsite boasting panoramic views and home to the majestic and endangered Walia Ibex. Next stop you’ll be transported back in time to Gondor. Steeped in history, it’s no wonder Gondar is another UNESCO World Heritage Site on Ethiopia’s long list. The home to kings for two centuries and dating back to the 15th century, Gondar’s collection of 12 castles is a sight to behold. The crown jewel of these has to be Fasilides Castle, complete with turrets and towers, like something straight from an African fairy tale. If you time your visit right you will be able to catch Timket, a religious feast day where pilgrims plunge into the Fasilidas pool in Gondar to celebrate Jesus’ baptism. It’s an insight into this deeply spiritual country and tops off your time in this stunning medieval city perfectly. After your flight into Addis Ababa you’ll be whisked away to the Bale Mountain National Park, a photographer’s dream with its diverse landscapes. By the end of your three days here you’ll be able to fill your photo albums with picture perfect backdrops from lush mountains to glacial lakes, while resting your head at the boutique Bale Mountain Lodge. Nestled amidst a verdant cloud forest with just eight rooms, you’ll be treated to privacy and seclusion as well as stunning vistas thanks to your 2380 metre viewpoint. Enjoy a day trip to Dinsho where you’ll come face to face with the native Mountain Nyala and much more as you climb Geysay Mountain on horseback. The pièce de résistance is the Sanetti Plateau, the best spot to glimpse the elusive Ethiopian Wolf, not to mention a selection of colourful sunbirds and eagles. Before you leave this spectacular country you’ll head back to the frenzied capital Addis Ababa and visit Merkato, Africa’s largest open-air market for a trinket to remember your eye-opening Ethiopian experience before catching your flight home.